Jinxy Knows Best: Natural Health Magazine Subscription - Only $4.58 Per Year! 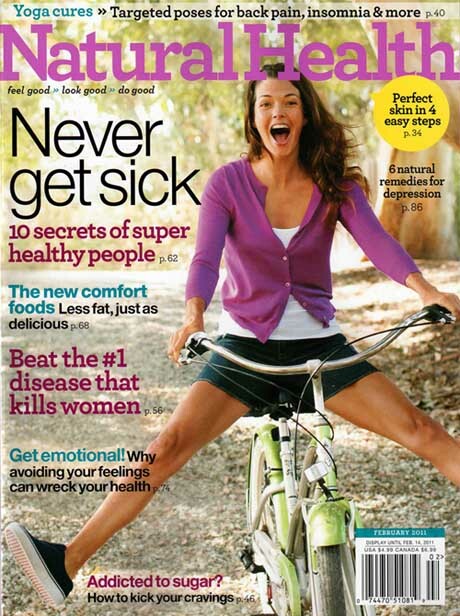 Natural Health Magazine Subscription - Only $4.58 Per Year! Natural Health can support your healthy lifestyle! Each issue features information on naturally-oriented food and nutrition, alternative health practices, exercise and self-care. Natural Health brings you info on the mind/body connection, illustrated exercises, preventative medicine, healthy cuisines and much, much more. On top of that it fills you in on the latest in natural foods, crafts, outdoor sports, organic gardening and holistic health. Tomorrow, 2/10/11, Best Deal Magazines is having a special offer to subscribe to Natural Health for a full year for only $5.39 PLUS you can use coupon code PXCJ213 to save an additional 15% off, bringing it down to $4.58. Subscribe HERE. - - NOTE: Even if you don't get this deal on Thursday, the regular price through Best Deal Magazines is only $5.95 per year, so it's still a great deal.